While I don’t use TradingView, I did skim through the article. It appears to have another viable formula for calculation currency strength. I was curious about the use of “Triple Moving Averages Foxx,” a free indicator, so I looked it up. The formula is online. It appears that original author (not Foxx) is simply smoothing his 3-MA with the 5-SMA from Foxx, so he probably could have just used a native 5-SMA from TradingView. Anyway, I suspect there are better moving averages to use to reduce lag, e.g. Hull or the Zero-Lag EMA. well i bought it at 1.04981 check 15m chart. it will make sense, for the new people. thanks dennis, best of luck. Top Trade AUDNZD gave us a small gain on Friday but the better play might be the previous Top Trade NZDCHF* after finding strong resistance at 0.6900 NZDCHF has broken support and looks poised to move lower. Democrats double down on Russiagate hoax giving the Bulls on Wall Street room to run. I was thinking that the separation between #1/#2 and between #7/#8 would also be important, especially when detecting a “change” of the best position. 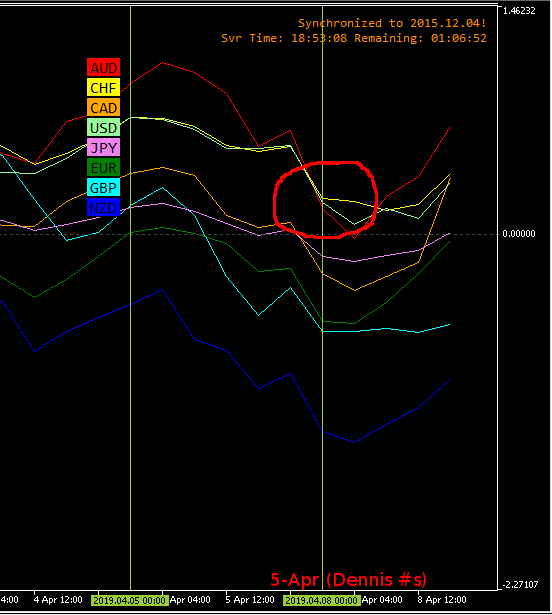 For example, the difference for 5-Apr of #1 (AUD) to #2 (USD) is 0.08% using Dennis’ numbers. Looking at this graphically, I see that AUD, USD, and CHF are so close together that having one switch the high position wouldn’t be all that relevant. In fact, using my broker, CHF does take the #1 slot, which it keeps for the first H4 this morning, but AUD takes it back the next H4. my values differ from Dennis’ because I use a different broker. my dates are one ahead of Dennis’ because I use server time. I’ve un-normalized JPY so I can see what it’s doing relative to other currencies. So, what separation would be meaningful? Maybe 0.15 to 0.20% minimum. I’m open to other interpretations. Here is some data if anyone wants to try it out. Gator Waaassss up budds. Have a great rest of the season. I have been playing with a strategy using Dennis’ SW that showed a lot of promise for year 2018 data, but didn’t hold up with older data (or the 4.5 months of 2019). I’m spelling it out in case it gives anyone ideas. Instead of placing a trade when there is a new “best” pair, you wait a day to confirm that same pair is in the spotlight. I used a fixed lot size of 0.1 for testing. Using 2% of equity surely gives better results. Paying attention to the actual strength value, e.g. > 2.0%, or the separation between #1/#2 and #7/#8 didn’t help this algorithm. The smaller SL & TP means that for a longer trend, you may get several profitable trades in a row. Ofttimes you get stopped out when a trend ends, but because of following the SMA34, this is often less than 70 pips. What I really liked about the numbers was the number of wins and incredibly low draw down. It was < 2%. Anyway, as I said, it didn’t hold up for more recent data or 2017 data, so I am still trying different ideas. i went long on this at 1.04981. got stopped out 1.05758. had i been a little more lenient, 1.05420, would have kept me in. hope this will help anyone. Trade with the trend is the best option for the newbies as it is quite hard to depict the trend reversal. There are the strategies which are quite good for depicting the trend reversal. But in the beginning stay way from them. Thank you so much!